Superchrome, the fast growing large format digital printing company, possesses the best canvas giclee printers available in the market; our canvas giclee printers enable us to create amazing giclee prints on canvas and several other media according to client specification. Compared to other printers, our canvas giclee printers are easy to use, versatile, have rapid image processing capacity, and possess advanced image editing tools and high quality image reproduction. With our canvas giclee printers, pictures are extracted through high resolution digital scanning and printed with archival quality inks onto canvas. Printing with canvas giclee printers is expected to give first rate color accuracy. 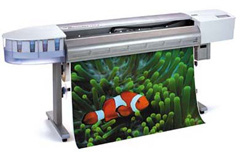 We utilize specialized 8 to 12 color ink-jet printers for giclee printing. Our superior printers are capable of creating exceptionally detailed prints for our clients. We employ printing processes that ensure high image stability and the use of lightfast pigment inks increases the print life. Another remarkable property of our canvas giclee printers is that the artworks on canvas can be reproduced to any desirable size regardless of the media, thus offering the artists the opportunity to customize the prints as required. Our giclee prints are practically useful to artists or organizations that require mass production of their work; we undertake large volumes of digital giclee printing onto canvas with minimal cost and at fast turnarounds. Employing the most recent imaging equipment and sophisticated technology, our printers can check minute gradations that are difficult to be detected and produce rare mixture of colors. Our canvas giclee printers are more durable than paper prints since they do not get wrinkled when rolled for mailing to our clients. We offer extra care to check that each and every print is audited for various quality factors, resolution, color correction, and size. We also offer canvas stretching and trimming services at nominal rates. You are most welcome to discuss your ideas with us, visit our website for more information on our canvas giclee printers. Or else contact us by phone or e-mail. If you would like to know more about canvas giclee printers, any of the projects shown or if you want to discuss any project you have coming up then contact us 020 7237 9333 or fax 020 7237 9444 or email sales@superchrome.co.uk. Our experienced personnel would be able to guide you appropriately.